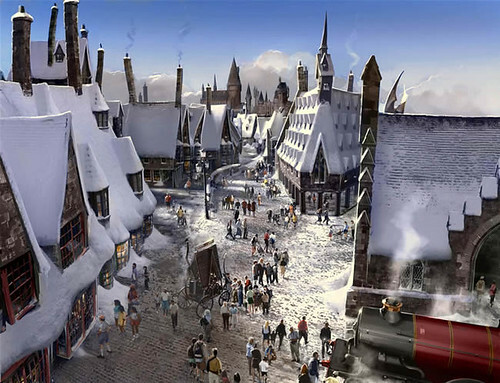 Hogsmeade Village from “The Wizarding World of Harry Potter.” Inspired by J.K. Rowling’s compelling stories and faithful to the visual landscapes of the films, fans will soon be able to experience the world of Harry Potter. Opening in 2009, “The Wizarding World of Harry Potter” will feature rides and attractions, as well as shops and restaurants that will enable fans to sample fare from the wizarding world’s best known establishments. Okay, even though I am a Harry Potter maniac, I will reserve judgment on this latest money-grubbing idea based on exploiting the Harry Potter theme. Universal Studios is opening a Harry Potter theme park in Florida, complete with the Hogwarts School of Witchcraft and Wizardry, the Forbidden Forest and Hogsmeade village. 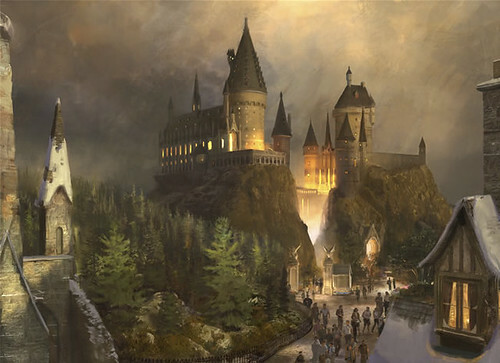 “The Wizarding World of Harry Potter,” will open in late 2009 in Orlando. “The plans I’ve seen look incredibly exciting, and I don’t think fans of the books or films will be disappointed,” said author J.K. Rowling, who has been working with a creative team to make sure the park resembles the books and films. The Potter theme park will allow visitors to experience iconic locations from Rowling’s magical world, such as Dumbledore’s office in Hogwarts and the shops in Hogsmeade. Stuart Craig, an Academy Award-winning production designer, has worked to bring the world of Harry Potter to life in all of the feature films to date. Craig leads the creative design for the theme park to ensure it remains faithful to the look and feel of the films. So what do you all think about this? On one hand, it sounds like it is receiving Rowling’s signature of approval since she is part of the planning (and thus, it sounds like it will be a lot of fun), but on the other hand, it will result in yet more Florida habitat being destroyed by land “developers” who are only there to get filthy rich at the expense of everyone and everything around them. Hogwarts Castle, the School of witchcraft and wizardry, from “The Wizarding World of Harry Potter.” Inspired by J.K. Rowling’s compelling stories and faithful to the visual landscapes of the films, fans will soon be able to experience the world of Harry Potter. Opening in 2009, “The Wizarding World of Harry Potter” will feature rides and attractions, as well as shops and restaurants that will enable fans to sample fare from the wizarding world’s best known establishments. This entry was posted in Harry Potter, Your Inner Child. Bookmark the permalink. Won’t work. Hogswarts is in Scotland, and I’m sure the residents of Florida won’t like the amount of fog and rain they’ll have to import to get the right atmosphere. The “right” atmosphere for the HP world is not really the best atmosphere for a theme park, you can only take realism so far, at the end of the day it is JUST a theme park. i wonder if one of their theme park rides will be as passengers in the magical flying car after it flies in to the whomping willow? Well, I’ll be a sourpuss. I would have preferred that we had a wildlife reserve named after Harry Potter to show children the magic of nature, with a bit of education thrown in. It will be really interesting to see religious wingnuts’ heads explode trying to stop this endeavor, which they no doubt will consider intended to indoctrinate impressionable children into the atheistic, secular, satanic, wiccan, homosexual lifestyle (kinda all the same to them, really). But why go to this theme park when you could go to a real-life school of magic? Speaking as a Floridian, our drought situation is close to the point where we’d do damn near anything to get some rain here. Seems like the US is being infested with fantasy theme parks! Consider, as well, Ham’s — or Graham’s, for that matter. Apart from changing the spelling from UK English to US English and the better cover art on the UK editions, are there any other differences between the UK and US editions of the books? Chris’ Wills: yes, there were. Certainly in the first book, the original, UK edition was about the “Philosopher’s Stone”; this was changed to “sorcerer’s stone” in the US addition because the publisher assumed that not enough people in the US would know what the philosopher’s stone was. There was also heavy editing for things like “rubbish bins”, changed to “garbage cans” for America because (dare I say it?) Americans apparently don’t know what rubbish is! Given the recent spate of creationist museums, mind you, there may be something to that. Re: this park — I’m against it, on the basis that (from my current understanding) it would not be developed on a brownfield site — it would be a new development, and that much less undeveloped land left in Florida. What a waste. I’m a designer of giftware for Universal Studios and i have a little inside info. The Harry Potter park is actually going to replace the Lost Continent area of Universals Islands of Adventure. True, the will have to expand upon the land somewhat, but its land they already own and use. Apparently, the Lost Continent was the least favorite/visited of all the Universal areas, and when another theme park tried to get the rights to Harry Potter and failed, Universal grabbed the opportunity. Obviously, the main goal of any business is to make money, but those at Universal heading up this project (whom i have met) are HUGE fans of the book, myself included. The thought of being able to become part of the story, so to speak, will be for many a dream come true.